Dress Ruby, in the reflections violetspour this Chateau de Beaucastel Châteauneuf du Pape Rouge on 1995. Very intense and pleasant nose on the raspberry jam, the plums wall up, the pepper and the soft spices. Round and fleshy mouth with pleasant tannic structure and one finale long marked by a freshness fruity. Wine very wall, impressive of balance and freshness for this vintage wine(year) at Beaucastel. 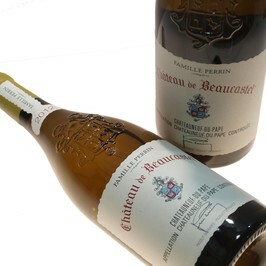 The Chateau de Beaucastel Châteauneuf du Pape red wine 1995 is to serve in 17°c on the pheasant, the squab. Chateau de Beaucastel exists for the XVIth century. In 1978, Jacques Perrin resumes the domain. Today, the Perrin family takes care of 100 hectares among which 3/4 are of naming AOC Châteauneuf-du-pape and 1/4 in AOC Côtes du the Rhône Coudoulet de Beaucastel. Every year one or two hectares are torn away and an equal surface is transplanted. With 13 vines, the Castle of Beaucastel signs a unique style every year by giving wines exceptional of power, structure, elegance and freshness.